Staying true to our sustainability policy,and mission, Genting Malaysia remains steadfast in upholding good corporate governance, conserving the environment, and appreciating our employees, the community and our valued customers. Our commitment in maintaining sustainable growth to enhance shareholder value has been proven with considerable achievements in the three pillars – economic, environment and social – through our proactive initiatives that have led to our resorts winning multiple prestigious awards and recognitions worldwide while achieving our sustainability goals. I am proud to note that Genting Malaysia was added to the FTSE4Good Index Series in June, demonstrating our strong environmental, social and governance (ESG) practices. We were chosen for meeting globally recognised corporate responsibility standards that were developed in collaboration with FTSE Russell. Earlier in April, we were named the Leading Multinational Corporation of the Year at the Global Responsible Business Leadership Awards (2018). We received the award from the Asia Pacific CSR Council for demonstrating leadership in corporate sustainability and achieving triple bottom line (People, Planet, Profit) success in our sustainability pillars. As a responsible corporate citizen, we understand the need to protect the environment for our future generation. Therefore, we have put in place various proactive and cost-effective initiatives that not only mitigate environmental impact, but also support the Government’s green policies and the United Nations’ Sustainability Development Goals. Our new initiatives include completely phasing out plastic straws, introducing biodegradable food boxes and plates at Resorts World Genting’s (RWG) food and beverage outlets and buying fresh produce from the local community around RWG to reduce our carbon footprint. Our Genting Green Generation (G3) volunteer programme, which started in 2017 saw over 600 employees registered as volunteers, had continuing success in 2018 with activities throughout the year that engaged our volunteers in RWG’s sustainability initiatives. To ensure true sustainability in our operations, we endeavour to continue engaging our stakeholders – from employees to suppliers and guests. 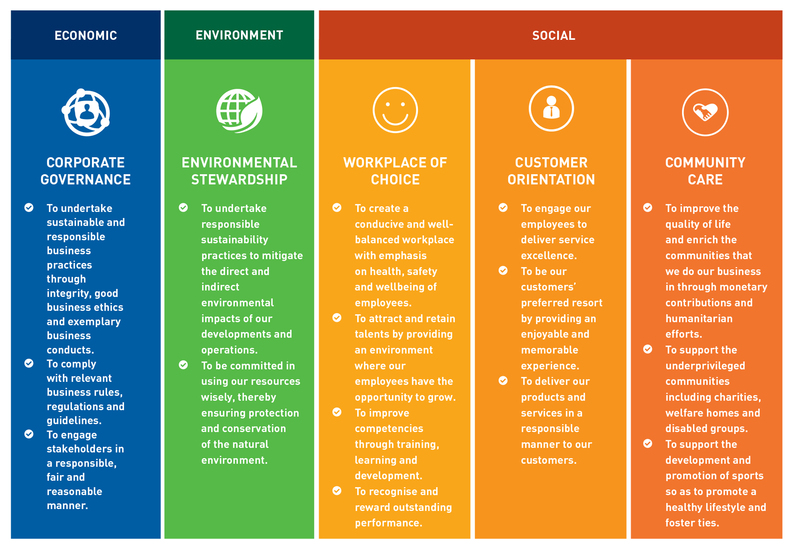 Attesting to our sustainable growth initiatives to create value for shareholders, we continue to put emphasis on the welfare of our employees and efficient talent management to deliver value for our customers. The Group’s investments in human resource training and development paid off when our team’s tireless efforts gained us multiple internationally-renowned accolades from esteemed travel guides. Amidst our achievements, we did not forget to give back to society as part of our sustainability agenda. Holding true to one of our core values – Compassion, Genting Malaysia contributed more than RM5 million back to the community, especially the underprivileged. This year’s report is testament to our commitment in executing our sustainability agenda by meeting the Global Reporting Initiative (GRI) Standards. We hope to bolster our future reports by reviewing the materiality topics in 2019. I would like to express my appreciation to all our stakeholders who have been part of our sustainability journey. Together, let us work towards achieving greater heights in 2019.